TPI NEXT, the Business Driven Test Process Improvement model Over the past ten years, TPI has proved to be the leading methodology to assess the maturity of an organizations or projects test process. This is a success we, at Sogeti, are very proud of. But this success by no means implies that we are `done and can rest on our laurels. Sogetis answer to this need: TPI NEXT, the Business Driven Test Process Improvement model (BDTPI). The strengths of the original model (Key areas, Maturity levels, Checkpoints, Improvement suggestions and Stepwise improvement) have been kept and have been made even stronger. The improvements that make the new model truly business-driven are the Clusters and the Enablers. Since business drivers change over time and from entity to entity, this model is flexible and adaptable, and works in synch with Sogetis other worldleading test methodology, TMap NEXT. But the Business Driven TPI model is independent so no matter what test method is used, this approach can be applied under any circumstance. 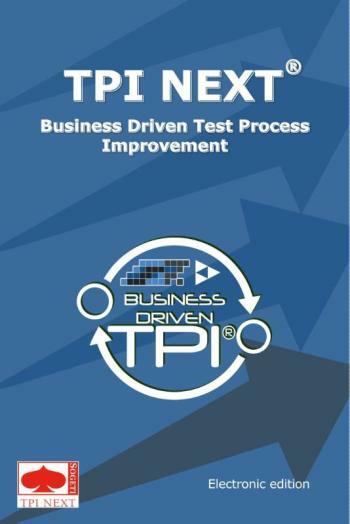 If you have not started improving your testing process, now it is the time to begin, and, with the TPI NEXT book at hand, it is now even easier to do so and to convince all of your stakeholders of its business value. But also, if you are already on the way to improving your testing process, a close look at Business Driven TPI will help you focus even more on the goal of improving your testing process, namely bringing business value to your organization!